The only Asian manufacturer to ever score an overall win at LeMans, this season, Mazda marked the 25th anniversary of that accomplishment by running the number 55 from the victorious 1991 Mazda 787B on one of the endurance racing prototypes racing at the 41st annual Toyota Grand Prix of Long Beach on Saturday, April 16th. With a presence in all levels of motorsports competition, the company’s relationship with racing dates back to the 1960s. Scoring 100 wins, Mazda’s RX-7 holds the IMSA GT record for the most victories ever achieved by a single model. The company has scored 23 class wins at the Rolex 24 Hours of Daytona and 13 class wins at the 12 Hours of Sebring. Further, the Mazda MX-5 roadster is the most popular sports car in contemporary road racing. Called the sport’s most active angel investor by Road & Track, Mazda also funds the development of young drivers. 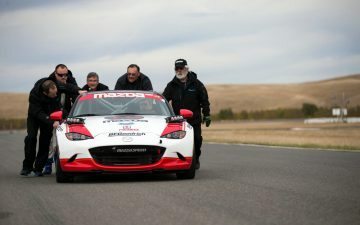 In fact, all four of the men piloting the two Mazda Prototypes came up through the Mazda Road to 24 ladder system of sports car racing scholarships. In a similar fashion, the Mazda Road to Indy ladder system supports fledgling racers in the open wheel categories. All of which benefits Mazda’s road cars tremendously. Further, just as racing engineers consider every aspect of a competition car in their efforts to improve speed and reliability, Mazda’s SKYACTIV philosophy does the same for its road-going models. Racing really does improve the breed, and Mazda uses motorsports competition as a laboratory to ensure all of its cars embody the soul of a sports car. The company races because pushing its cars to the extremes ultimately makes them better—and more fun to drive.